You'll learn about the history of horse racing and the horse industry in Lexington. Saddle up as you start the historic journey at Keeneland for a tour during the early morning workouts. 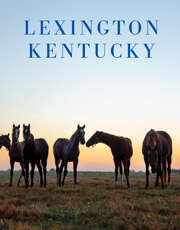 You'll visit one of the beautiful historic horse farms around Lexington. You'll also make stops at the Red Mile and the Isaac Murphy Memorial Art Garden. You'll learn the history of these historic racing venues along with the first superstars of horse racing, African American jockeys. The tour will last approximately 4 hours and pick up will be at the Lexington Visitors Center or Keeneland. Price includes tours at Keeneland and a historic horse farm. Water and snacks will be provided.